Who should bear the risk in the sharing economy? Innovation comes in many forms – from new products and ideas to new processes and new ways of thinking – all of which necessitate a new approach to risk management. Lloyd’s, as an insurance market, has a unique vantage point in not only watching innovation unfold but also in providing the protection that enables new and disruptive technologies to progress. One of the fascinating elements before us at the moment is the disruption led by shared platforms. Lloyd’s has long provided insurance solutions for tangible physical assets, but when thinking about protection for a shared economy model, the greatest threats are often intangible – notably trust and reputation. According to the 2018 Edelman Trust Barometer, technology remains the most trusted industry sector. However the trust and credibility survey also demonstrates just how fragile trust can be. In our own industry, the foundations of trust are built on a promise to pay valid claims in the event of a loss. Upholding that promise over centuries engenders confidence and credibility – the lifeblood of the Lloyd’s market. Understanding the foundations of trust in the shared economy, and the potential threats that could upend it, is critical to the continued growth and success of this disruptive sector. 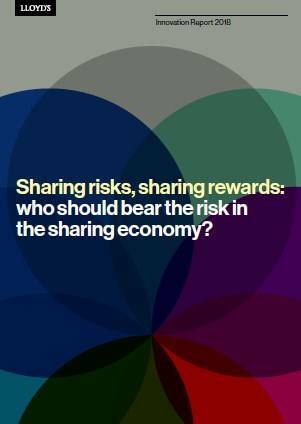 The report that follows is the first of two that will explore the behavioural economics of consumer preferences and attitudes toward risk in the sharing economy, an important first step in reducing risk and building trust.